The chilly New York weather (oh, who am I kidding - it's damn cold!) means we stay home a lot more on Saturday nights and that seems to lead to some fun cocktail experiments. We love spiced rum but, thanks to the Captain's Table Challenge, the good folks at Captain Morgan have introduced us to their spiced BLACK rum. It's far more potent than their classic which makes it perfect to mix with sweet liqueurs. 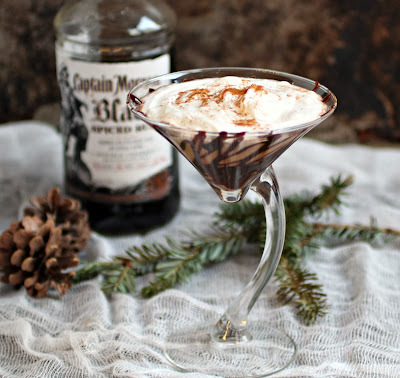 Mudslide cocktails are usually coffee and Irish cream liqueurs, with or without a bit of vodka. But we tried it with the Black rum and loved it. Then we increased the chocolate flavor with ice cream and the spice with a hit of cinnamon. A little extra chocolate sauce and whipped cream? Don't mind if we do. Because the black rum has a strong, well rounded taste, it doesn't get lost among the other flavors and it even helps tone down some of the sugar. Best of all, it's easy to mix up a big pitcher ahead of time and serve it to holiday guests. Cheers! Place some chocolate sauce (store bought is fine) in a squeeze bottle and line the inside of a cocktail glass. Place it in the refrigerator to set while you mix the drink. 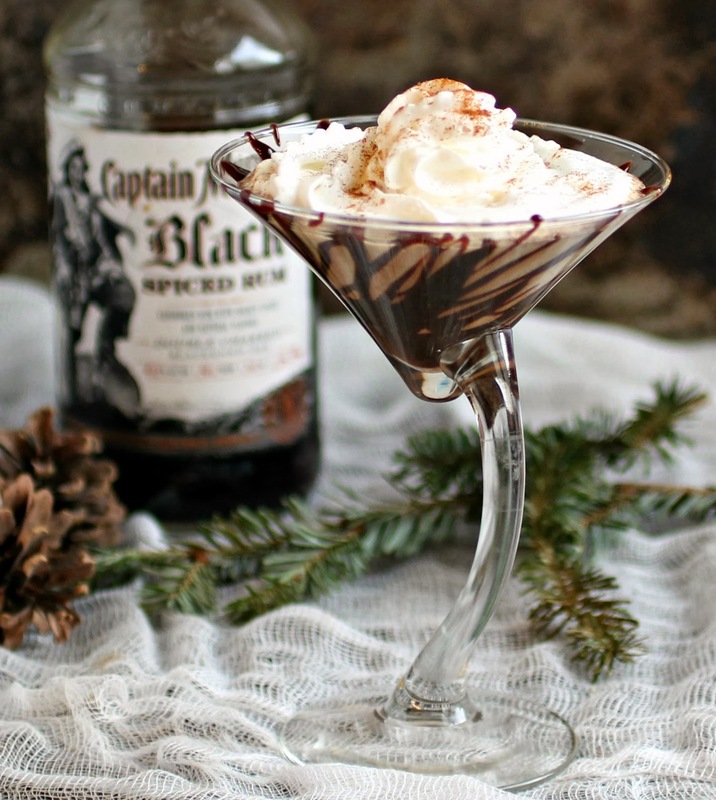 Combine the rum, Irish cream, coffee liqueur, chocolate ice cream, cinnamon and cream in a cocktail shaker. Fill with ice and shake well to dissolve the ice cream. 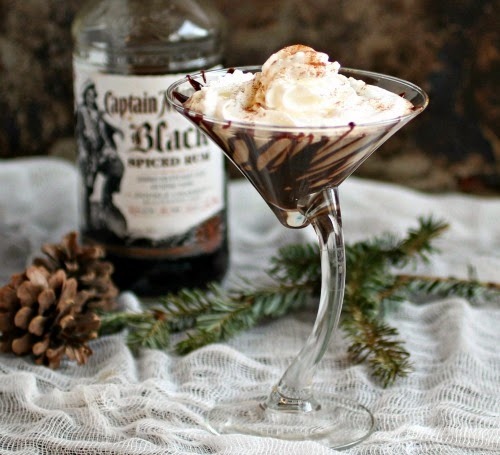 Pour into the chilled glass and top with whipped cream and another pinch of cinnamon. This recipe is part of the CaptainsTable challenge where I get to play with rum and make fun cocktails. More importantly, for every recipe that anyone posts with the #CaptainsTable hashtag Captain Morgan Rum will donate $1 to WhyHunger. So, if you have recipes to share on social media, please add the hashtag as well and check out other ideas on their Facebook and Pinterest pages. Oh. My. God. Is is bad that it is 7am and I'm still in bed and I wish I was drinking that right now? That looks so darn good! I love that you use ice cream in your mudslide and the Black is definitely my favorite but I've always preferred black rums. This looks so good! with the ice cream included I would probably just drink too many but it would be worth it! I have never seen this type of post from you,You tried something new!! Good for you! I have always afraid I'll mess when I try new things. What made you decide to try something new? I want to motivate you. This looks really interesting and tasty, thanks a lot for sharing this!